Britain, Tea, and Hot and Cold Running Stereotypes | Notes from the U.K.
Am I calling up a lazy stereotype when I say that Britain’s a nation of tea drinkers? I know: This isn’t the most important question you’ll face today, but stay with me. I’ll make it worth your time (she said rashly). A while back, someone read part of an as yet unposted blog entry I’d written about tea and told me I was indulging in stereotypes. She mentioned beer (people do drink a lot of beer here; I’ll give her that), and Starbucks, and the country’s changing habits. She urged me to go deeper into the culture. She didn’t mention Starbucks’ untaxed profits, and I admit they’re not what everyone’s mind would race to in this context, but if you want to go deeper into the culture, they’re sitting there like the Titanic’s iceberg and I can’t type the company’s name without mentioning them. And don’t even get me started on Amazon. 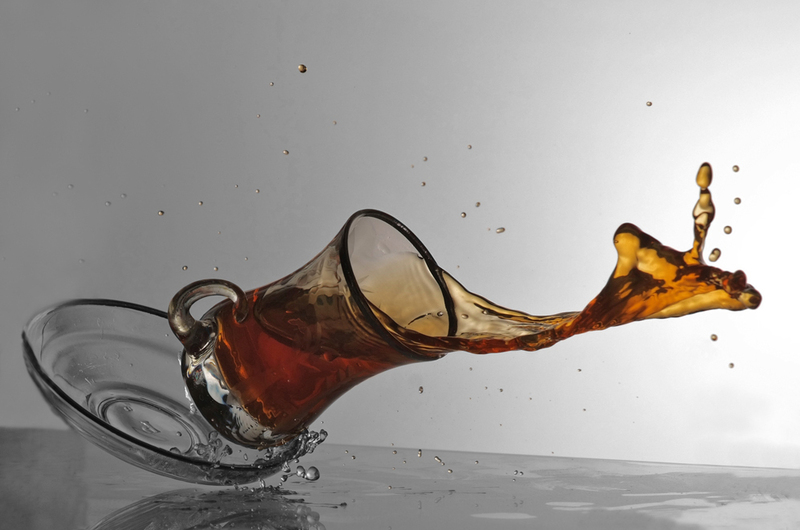 A cup of tea, in motion. Photo by by ŇÄĵŵÅ Ă. Мǻŗǻƒįę. She signed off by saying her husband had just made her a cup of tea, which either means she has a sense of humor (she hadn’t noticed mine, so I did wonder) or undercuts her argument, or possibly both. Either way, she left me thinking about stereotypes. Because they’re hard to resist if you’re trying to be funny—and the longer I work on this blog, the better I understand how deeply trying and funny dislike each other. But I don’t want to stereotype stereotypes. They’re not all the same. Off the top of my head I can break them into two categories. And as soon as you say something like that, someone else comes along and breaks them into seven categories, and someone else comes up with forty-three. Settle down, everyone. It’s not a competition. All we need for this discussion are the harmful kind and the harmless kind. Think of them the way you’d think of spiders, or snakes: Some of them are venomous and some of them aren’t. Remember at the start of the Iraq War, when the French said, Guys, I don’t think this is an entirely good idea, and suddenly the geniuses who (as it turns out) helped destabilize the Middle East were calling them cheese-eating surrender monkeys? That’s not only a very weird stereotype, implying, among other things, that Americans think there’s something suspect about eating cheese, but it’s ugly. (I know, it started ironically, on The Simpsons, but by the time I’m talking about it had cut its ironic moorings and was loose in the world, untethered.) It’s not the most harmful stereotype I ever heard, but it’s surely one of the stranger ones in its category. Now compare that to the claim that Britain’s a nation of tea drinkers. They’re different, aren’t they? Is Britain a nation of tea drinkers? We have two cafes in our village, and both have invested in coffee machines. You know the kind. Huge silvery things. You stand behind them and you might as well be piloting a spaceship. So customers are tractored in, and they’re grateful. They order lattes and americanos and mocha half-decaf double skim vaguely Italian-sounding whatsaccinos, and they sit at tables in (if they’re lucky) the sun and sip them. But what they’re sipping are indulgences—the kind of thing people will invest in and think, I really needed this, or, Isn’t this nice, sitting here with a coffee? because it’s something special. Follow them home, though, and most of them will drink tea. If they have coffee in the house, it’ll be instant. How do I know? By what people offer me in their homes. By what they choose when they’re in mine. But forget the cafes. Go to a village event—the kind the village has been holding since caffeine first came to these shores, raising money for the hospices, or the air ambulance, or the church—and you’ll have a choice of tea or coffee. And the coffee will be instant. Because that’s how it’s always been done and that’s how it’s still done. Any place has a tea pot. Any place can boil water. Not every place has a coffee pot. What happens in the U.S.? Park yourself at the counter of any greasy spoon in the country and ask for coffee. The waitron will turn, grab a pot from a coffeemaker and pour. It’s already made, it’s waiting for you, and most of the time it’s no older than you are, so it’ll taste—well, it’ll taste like coffee. Whether that’s good is a matter of opinion. But it doesn’t matter. They go through enough of it to keep a pot on hand. Two pots, actually: regular with a black (or is that brown?) handle and decaf with an orange one. Ask for tea, though, and the waitron will have to check with the boss, because it’s been six years since anyone ordered a cup. I worked in a place like that. The boss probably kept a box of teabags stashed somewhere, but I never had a reason to ask about it. That’s what life’s like in a nation of coffee drinkers. But I hate being called superficial, so let’s consider countervailing trends: Before I left the U.S., I’d begun to worry about the younger generation’s moral fiber, because so many of them were getting their caffeine from soft drinks and energy drinks and cold bottled coffees or (yes, I admit it) teas with vacation-sounding names and enough sugar to fill a bathtub, condensed somehow into a fist-sized drink. This struck me as childish—self-indulgent, even. Adulthood involves learning to drink things that don’t taste good, and then learning to like them, and teaching other people to like them, and judging people on the basis of whether they like them. Weren’t these kids ever going to grow up? And more to the point, when it came time to give them house-warming presents, was I ever going to be able to give them coffee mugs? I should probably pause here and say that I’d stopped drinking coffee by the time I passed this judgment on an entire generation, but I didn’t get my caffeine from cold, sugary drinks, so it was different. And I had once been a coffee drinker, so whatever I did after that was okay, because I’d survived the initiation. I never claimed that this made sense. What I’m trying to do is make a point, which is, defensively, that I’m capable of going deeper into a culture. And still exaggerating. Which is the essence of stereotype. And the essence of humor. Or, yeah, I’m exaggerating again. It’s the essence of some humor. If you go deep enough into any culture, you’ll find something to laugh at. Without dismissing it or being ugly. This entry was posted in Food, Other Stuff and tagged Americans in Britain, Americans in England, British food, coffee, stereotypes, tea by Ellen Hawley. Bookmark the permalink. Great picture, isn’t it? All credit to the photographer, whose name, unfortunately, I can’t read. I found it on WikiMediaCommons, when I was looking for some boring tea-with-milk picture, and I couldn’t resist it. Or add milk to it. Take this argument & extend it to alcohol. Which you don’t drink and probably don’t have enough information about for a true send up. I actually like the taste of a martini. It has to do with snitching the olives out of my parents’ drinks as a kid. I once told someone (a good deal older than me) that I liked the taste and she said, “No one likes the taste of a martini. You just drink it to get high.” How does one defend oneself? You are entirely right that adulthood is about learning to drink things most younger people with sensitive taste buds wouldn’t touch. How else to explain my current infatuation with green tea, especially the ones called Sky Between the Branches or Monkey Picked Kwan Yin? Anyone with any sense points out that green tea tastes like pale, warm water. And yet I love it. I’ve had green tea that tastes like freshly mown grass. I prefer the stuff that tastes like pale, warm water. Whereas, I have only recently discovered that I have been over-steeping and possibly boiling to death my green tea, making it taste like moldy towels made of hemp. Weak, warm water or freshly mown grass would be preferable. Mmmm. You make it sound irresistible. Can I have a cup? I do remember splitting a canister of fancy Chinese green tea with a neighbor and–I don’t know, it looked so pale when I brewed it that I kept adding leaves to the strainer. By the time I was convinced I had tea there, it was strong enough to put hair on my tongue. A friend here drinks hot water when she’s caffeined up to the gills, and for some reason I tried it myself recently, although I always thought it would be kind of nasty. It’s actually very nice and soothing. I have learned that teas all time at different rates…and that, apparently, I’ve been killing the black teas by using boiling water. P.S. Love the hairy-tongued imagery. In my barbarian opinion, it doesn’t pay to overthink some things. I use boiling water on black tea. It seems to make good tea. I am one of the British people responsible for perpetuating the tea stereotype. I love the stuff. My day is off to a bad start if I do not get a mug of hot tea down my neck before I have to crack on with stuff. I also offer guests a pot of tea when they arrive at my house. And any time someone is dealing with something glum I will automatically pop the kettle on and get the teapot off the shelf so we can talk it over with a cup of tea in our hands. I should add that I do not drink coffee at all, just don’t like the stuff, so I am immune to the whole barista, coffee bar culture anyway. That maybe helps shore up my love of tea. When I first visited America, in 1995, the tea was terrible. Speciality teas like Earl Grey and Lapsang were rare as hen’s teeth and the normal everyday breakfast tea was disgusting. However, over the years it would appear that Americans have developed more of a palate for tea. Which is just as well as I was quite panicked by the thought of moving to a country that was short on drinkable tea. I might even have considered smuggling some tea bags in our shipping container. I was delighted, therefore, to find that my local supermarket stocks a huge variety of tea and even a British blend black tea that tastes just like “back home” tea. I will survive. Understood completely. An English friend who visited us once in Minnesota still calls American tea “that gray stuff you drink.” But I did, gradually, learn which coffee shops in the Twin Cities had drinkable tea, because even though I gave up coffee years ago (I can drink two amounts of the stuff: too much or none) I was still addicted to coffee shops. They’re great places to write. And, although our supermarkets sold fairly dismal tea, an Irish shop sold Lyons, so life was possible. And now that I like in Cornwall, visiting Americans tell me the coffee’s terrible. Apparently it’s not physically possible for a country to do both well.